What is with all the fashion blogger haters out there? For every person that is embracing the blogger another is putting them down. I just read an article that Sassybella tweeted from the Australian Finacial Review about fashion bloggers and thought it would be a great topic for a rant. 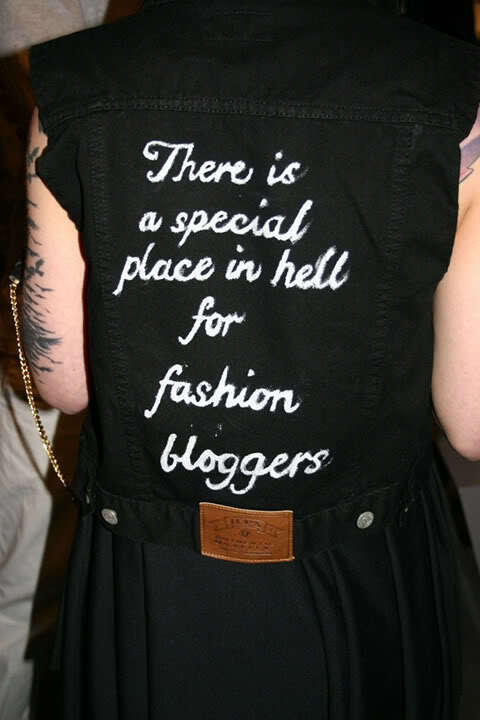 The article looks at the presence of bloggers, designers attitudes towards them and finally finishes with fashion editors attitudes towards them (to read the article click here). What really inspired the need to rant was Kirstie Clements's ( a.k.a editor in chief of Australian Vogue) quote about bloggers; " ...bloggers haven't quite broken into the serious side of fashion yet...It's easy to look at a dress on the catwalk and say "Oh, how pretty". That's simply a opinion it's not power". Her opinion is her opinion, fair enough but it kind of implies an idea that fashion bloggers have, the illusions of graduer we hold. I can't speak for other fashion bloggers but I don't think I'm expert in fashion, my future career will more likely be in the field of Psychology than fashion, so the comments made by editors in the article about the qualifications of fashion bloggers are valid in regards to me. But I am totally aware what I write on my blog is my opinion, but that is why I blog; to express my opinion about things fashion. And isn't that why a lot of bloggers blog, it is a means for them to explore fashion and express their thoughts and opinions. Which brings me to the idea of bloggers and power. Now I am in no way saying that I have any kind of power as a fashion blogger, but I do have power as a consumer. Majority of the consumers out there don't have a degree in fashion or a "deep understanding of all aspects of the fashion industry" (which Kirstie highlights as a fault of bloggers). But this is exactly why bloggers have power, we are the ordinary consumers of fashion. We decide what we like and what we buy, sure magazines like Vogue may dictate the trends but ultimately we decide what we buy and where is all of this reflected? On our fashion blogs! End of rant. Agreed as to the point of the power of the consumer but in defense of Kirstie Clements, at least she is informed. As dismissive as she is, the attitude of designers like Alex Perry who is quoted as saying "I prefer to work with someone whose credentials I know...Blogs often descend into hate and mudslinging..." is far more harmful. It's an utterly luddite, outdated notion that a democratic forum where people share their opinions is by definition worse than the prepackaged variety of fashion that magazines publish. Afterall, any newspaper article published online can have all sorts of intolerant comments on any article (I read the Washington Post and some of the things people come up with are ridiculous!) but since he knows the credentials of the publishers and journalists, the hate-slinging in the comments is acceptable? Clearly not, therefore blaming blogs for the reactions they cause is also completely irrational. However, there are blogs that engage in irresponsible or sensationalized publishing - as does the print magazine the National Enquirer - this does not mean all blogs are the same. His comment reveals pure ignorance of the rich online community that exists. So as bloggers I think we just have to work to change that opinion, or, just let him think what he thinks and exercise the power of the consumer because afterall that is the final judgement on any collection he creates. Sorry for the mini-rant. Love the subject! Or even beyond that, if you blame bloggers for the hate on their posts in the comments (which btw most blogs monitor more carefully than most newspapers) you have to blame the journalists whose articles inspire those same types of hateful comments. i totally agree with you about bloggers being consumers. who else are these designers making clothing for? who are these magazines catering to if not the consumers? we bloggers express our opinions on our individual blogs because we are the ones buying the clothing. i'm no fashion designer--but that doesn't mean i can't put my opinion on my blog for anyone who wants to read it. i love going to fashion blogs and seeing what looks they like. it gives me ideas, which is more than i can say for certain designers and mags some times. I agree with you, very well said. There are of course many different kinds of fashion bloggers to - some of them are very fashion educated and others quite happy to do it for fun. Then there's the fact that heaps more learn in the process!